A flavoursome Japanese Chicken Katsu is just what you need. 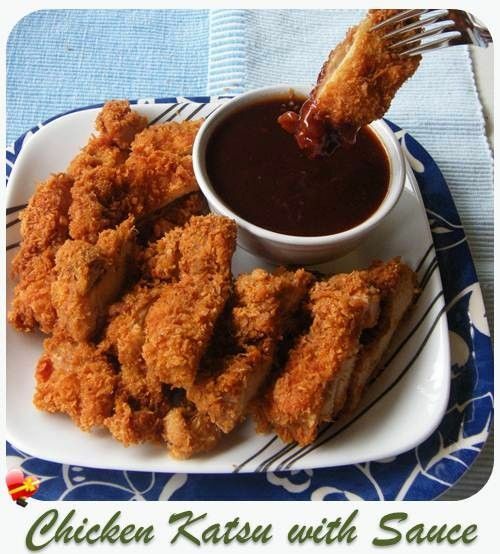 With crunchy chicken schnitzel, Japanese curry sauce and served on a bed of rice this mild sauce is perfect for the whole family. With crunchy chicken schnitzel, Japanese curry sauce and served on a bed of rice this mild sauce �... Add chicken. Cook, for about 4 minutes on each side, or until golden brown and cooked through. Remove. Drain on absorbent kitchen paper. Cut into 1cm thick slices. Cook, for about 4 minutes on each side, or until golden brown and cooked through. Place the chicken katsu and spoon a generous amount of katsu curry on top of the chicken. Top with another sushi rice patty. Top with another sushi rice patty. For added help to stay intact, you can wrap the rice burgers using a parchment paper (this is �... We�ve sourced and blended all of the unique flavour ingredients to make our authentic Chicken Katsu Curry. We bring these all together in a recipe kit, which consists of 3 flavour pots; a Katsu Curry Paste pot, a Gochujang Sauce pot and a Pickled Radish Mix pot. Hmm looks delicious, I love chicken katsu! I made it the other day using your chicken katsu don recipe and served it with store-bought tonkatsu sauce and a salad instead of serving it over rice.... Chicken katsu is served with a tonkatsu or katsu sauce. This recipe is better than Japanese takeout! This recipe is better than Japanese takeout! I always love a good twist on a classic dish. Cook chicken for 3 to 4 minutes each side or until golden and cooked through, adding extra oil if needed. Transfer chicken to a board. Cool for 2 minutes. Thickly slice. Transfer chicken to a board. Cool for 2 minutes.... Notes. To make this dish vegetarian, replace the chicken with tofu, omit the Worcestershire sauce from the Katsu and use vegan mayo. Katsu sauce will keep for 4 weeks in an airtight jar in the fridge. Place the chicken pieces between 2 sheets of baking paper and beat with a meat mallet to ? cm thickness. Place the eggs in a shallow bowl and the flour in a separate shallow bowl. Season flour. Add chicken. Cook, for about 4 minutes on each side, or until golden brown and cooked through. Remove. Drain on absorbent kitchen paper. Cut into 1cm thick slices. Cook, for about 4 minutes on each side, or until golden brown and cooked through. Cook chicken for 3 to 4 minutes each side or until golden and cooked through, adding extra oil if needed. Transfer chicken to a board. Cool for 2 minutes. Thickly slice. Transfer chicken to a board. Cool for 2 minutes.